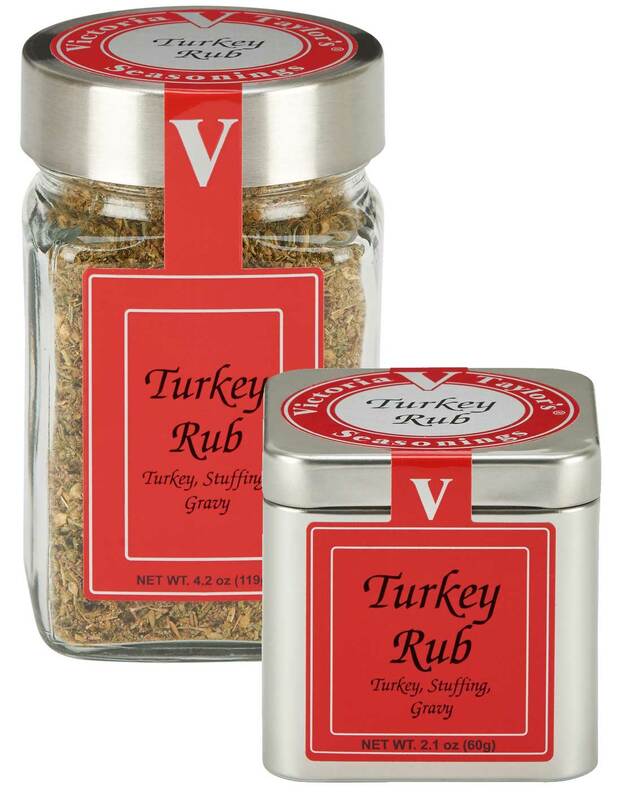 Victoria Taylor's Turkey Rub is a perfect combination of spices and herbs developed specifically for the holiday turkey and the stuffing. Sage, garlic, rosemary and thyme accent this special seasoning. Choose one of Victoria's many turkey and stuffing recipes such as Orange and Fennel Roast Turkey, Apple Corn, Bread and Pecan Stuffing or Wild Rice and Mushroom Stuffing to create your holiday menu. Victoria's Turkey Rub also adds great flavor to chicken recipes and is delicious in her Sage & Onion Flatbread. Mixed herbs and spices (celery seed, fennel, marjoram, parsley, rosemary, sage, thyme, white pepper), garlic and onion, sea salt.